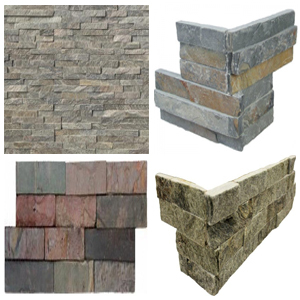 Ledger Panels also known as Stacked Stone Ledger Panels, Ledge Stone Panels, Veneer Panels or simply Ledge Stone have become the most sought after product for interior and exterior wall cladding. They are being produced in a variety of stones such as Marble, Slate, Travertine and Quartz the most popular ones are California Gold, Arctic White, Golden Honey, Roman Beige Travertine, Ivory Travertine, Scabos Travertine. 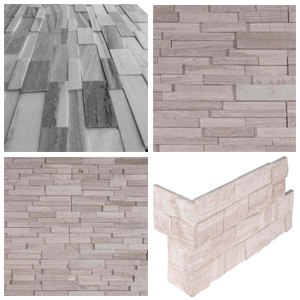 Due to the huge interest of industry professionals like interior designers, architects, home builders and contractor in this product the manufacturers have developed this product in some really awesome looks and finishes like Splitface, Honed and even in 3D Stacked & elevated. Interior designers are frequently using this product on fireplaces, exterior walls, Interior accent walls, kitchen and bathroom backsplash walls to give a century old vintage look. The product is offered in a range of colors right from some muted Shades as White, Ivory, Beige to darker tones like grey, black to some really vibrant multi colors. 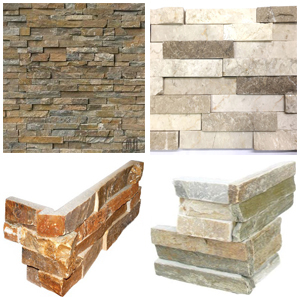 The product brings life to any area be it a featured wall in the living room, bathroom or kitchen. On the façade with other natural beauty of plants and vegetation it flows so well. 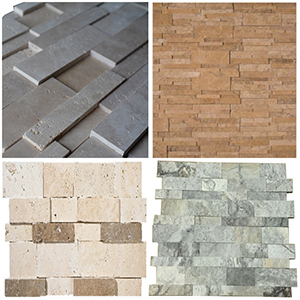 Small pieces of stone are hand glued together in such a beautiful way to produce a 6x24 or 7x20 size tile which is easy to install. The ledger corners are also available to save the installer’s time and give an absolutely clean look to the Project.